Computer control of the IC-7100, IC-7200, IC-7300, IC-7410, IC-7600, IC-7610, IC-7700, IC-7850, IC-7851 and IC-9100 is accomplished with a simple USB transceiver-to-computer connection. Computer control of older Icom transceivers is accomplished via a bidirectional CI-V bus, which uses an asynchronous protocol communicated via TTL voltage levels. Thus an external interface between your Computer and your transceiver's CI-V jack is required. The basic function of the interface is voltage level conversion from the RS-232 levels used in a standard serial port (+12 and -12 VDC) and the TTL levels used by your transceiver's CI-V bus (+5, and 0 VDC). The interface itself requires power, which can be provided either externally, or with some interfaces by using one of the serial port modem control signals as a power source. Recent Icom transceivers can be switched between RX and TX using CI-V commands: IC-756Pro, IC-756ProII, IC-756ProIII, IC-7000, IC-7100, IC-7200, IC-7300, IC-7410, IC-7600, IC-7610, IC-7700, IC-7850, IC-7851 and IC-9100. 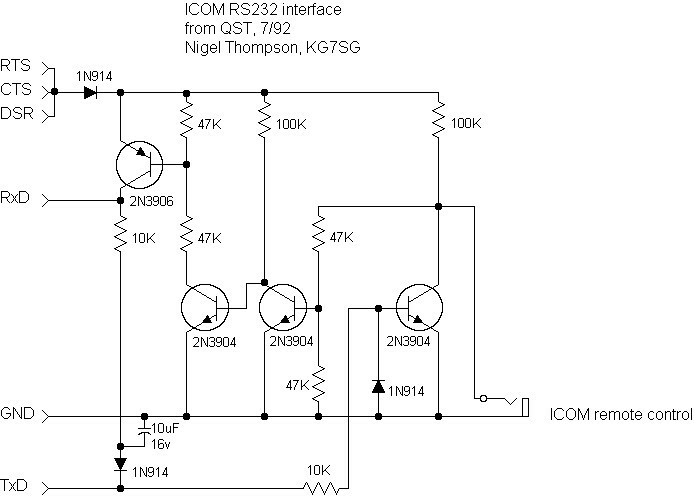 All other Icom transceivers requires an external circuit that drives the tranceiver's SEND input (pin 3 on the backpanel ACC1 or ACC2 connectors). Commander can be configured to drive this external circuit from the serial port's modem control signal (DTR or RTS), or from a parallel port's pin 17. 1. do you want to use one of your PC's serial ports, or one of its USB ports? 2. would you prefer to build something or buy it? Being able to choose #1 is a relatively new option. Previously, controlling a transceiver via USB port meant purchasing a USB-to- serial-port adaptor (e.g. from Belkin or ByteRunner) and connecting it to your interface's serial port. Now, however, there are off-the- shelf USB interfaces; see, for example http://www.microham-usa.com/Products/USB.html . You can also build one of these yourself, as described in http://www.eham.net/articles/8192 ; if you go this route, be sure to read the comments, as the circuit as presented contains an (easily correctable) defect. If your PC has a spare serial port, or you'd prefer an outboard USB- to-serial-port converter, then you'll have many more choices with respect to the interface - down both the "buy it" and "build it" paths. If you use one of your PC's USB ports, configure Windows to not automatically power down this port. You'll find product reviews of the above, along with more alternatives at http://www.eham.net/reviews/products/53 . uses the MAX-232 IC for level conversion rather than discrete transistors. It also includes a circuit to control your 706's PTT circuit using one of the serial port modem control signals, which you'll find convenient if you're planning to operate digital modes.